Weighty Matters: Parental "No" Files - Canada's Wonderland, Where Healthy Eating is Banned! 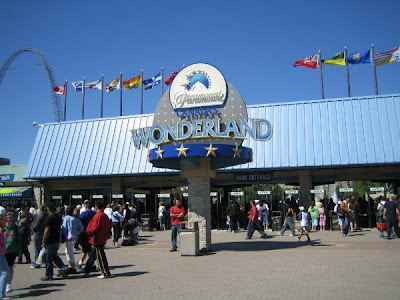 Parental "No" Files - Canada's Wonderland, Where Healthy Eating is Banned! This one's courtesy of a great blog post by Toronto based pediatrician Daniel Flanders. The long and the short of it is this: If you're planning a trip to Canada's Wonderland your kids are going to eat junk food all day long. There's literally no way around it. You see according to Dr. Flanders there are food police working the entrance to the park. Every bag is searched for "outside" food, and so when Dr. Flanders' family got searched, their home made healthy lunches were deemed contraband and were confiscated. "Scratching my head, I wondered, why the ‘no outside food’ policy? As I walked through the facility, The answer became quite clear – there is way too much money to lose when allowing patrons to bring their own food. A pizza costs $25.00. A fountain drink: $4.00. A bottle of water: $3.00. ”Criminal” I thought to myself." And I can't help wonder whether or not it is? Given what else passes for human rights violations in our country you'd think that we'd have the human right to decide what food we'd like to eat when spending a by definition day-long activity where meals are undoubtedly required. Whether it's for medical, religious or preventative health reasons I would have thought preventing people from bringing the food of their choice to a location where the primary fee is for non-food based entertainment would, even with a private enterprise, be a denial of their basic rights. If there are any Canadian lawyers reading this post, would greatly appreciate their opinion as to whether or not it is legal to ban "outside" food from Canada's answer to Six Flags? But of course for those of you who feel that the sole line of defense against an environment that incessantly pushes junk food down our children's throats should be a parent who says, "No", clearly it was well within Dr. Flanders' power to turn around at the gate and not take his kids to Canada's Wonderland. But do you really think that's the answer? While I'm certain at some point to bring my children to Canada's Wonderland, reading Dr. Flanders' post I'm now also certain it'll be an extremely rare visit rather than a more regular one. Go on and read Dr. Flanders' post. It's excellent and eye-opening.